Is It Time to Consolidate Legacy, Siloed Receivables Systems and Operations? The US insurance industry is tackling significant challenges today, including the need to increase revenue streams while accommodating a customer base that expects to be able to do virtually everything online or with an app. This is playing out against the backdrop of ever-increasing technical complexity and ongoing regulatory changes. It’s challenging enough with a modern, unified platform, but even more challenging if you’re managing a crazy quilt of different systems and platforms just to piece together a working view of all the moving parts of your company’s financial engine. Without a holistic, real-time picture of your receivables, you’re left without a reliable source of data for making business decisions. 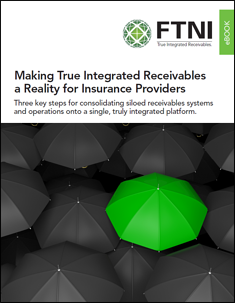 You can eliminate these challenges by using a single platform to meet all your receivables processing needs—what we call true integrated receivables. A truly integrated receivables solution gives you the ability to accept any payment method (check, one-time or recurring ACH and credit card, cash) from any payment channel (mailed-in, lockbox, called-in, in-person, online, mobile, etc.) on a single platform that can accept, process and post payments in a single pass. That data is automatically delivered for posting into your company’s backoffice system, too—which means you don’t pay your employees to perform manual labor when they could be working on more strategic, value-added work. This eBook is designed for insurance providers of virtually any size that are seeking proven solutions to cure outdated, inefficient, and costly AR systems and processes.